An annual tradition signifying the end of the famed Hamptons social season, for the past eight days the Classic has hosted every level of horse and rider from the smallest leadline competitor up to World Cup, World and Olympic Champions such as Sunday’s winner, McLain Ward. Course Designer Michel Vaillancourt built a challenging course at the maximum height of 1.60m, including a line of jumps taking the competitors nearly the entire length of the packed VIP tent. The tough course was a true test of ability, resulting in just five horse-and-rider pairs advancing to the jump-off round. The start order was determined by the final placings in the $75,000 Douglas Elliman Grand Prix Qualifier earlier in the week, which meant the better you did Friday, the further down in the order you went on Sunday. Ward was in the bottom third. 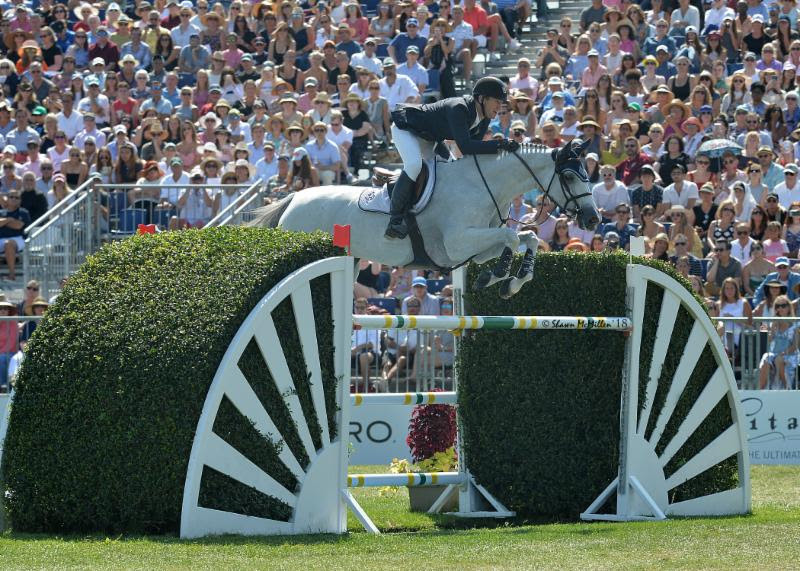 Friday’s winner, Ireland’s Shane Sweetnam, had the luxury of being the final rider to go in Sunday’s Grand Prix. They jumped a clean round, which meant they jumped last in the jump-off. Ward, never one to ride for second place, pulled out all the stops with HH Gigi’s Girl, the 10-year-old grey mare owned by Double H Farm. They cleared the course and flew across the finish line in a time of 39.32 seconds, knowing speedy Sweetnam was yet to come. The only time Ward let up on the gas was heading to the very last fence, and only for a split second, knowing that if he pushed any more, he would risk having the last jump down. Ward and HH Gigi’s Girl finished with a clean score, in a time of 39.32. Eventual third-place finisher Lucy Davis was unable to catch Ward’s time. Caracho left the jumps up, but they crossed the timers in 42.47 seconds. Last to jump, Sweetnam had to contend with Main Road bucking sporadically in the jump-off, both upon landing and while galloping between fences. They crossed through the timers with no jumping faults in a time of 41.24 seconds to finish in second place. The top three riders each received beautiful new timepieces courtesy of Longines. Although Sweetnam would have to be content with second in the class, his lead in the $30,000 Longines Rider Challenge was so strong that he easily held onto first place and took the title for the second time. Having been awarded one Longines watch for finishing second in the Grand Prix, Sweetnam received a second watch for securing the Longines Rider Challenge. Adding these to the watches he won in Friday’s $75,000 Douglas Elliman Grand Prix Qualifier presented by Longines and Saturday’s $70,000 Longines Cup, Sweetnam certainly won’t have an excuse to ever be late! The 43rd Hampton Classic featured over 200 classes in six beautifully manicured show rings. One of the most spectacular equestrian events in the nation showcasing the highest levels of hunter-jumper competition, the world-class event hosts hundreds of top riders and horses from all over the nation and world.